On this episode of the iDisciple Podcast, iDisciple CEO David Henriksen is joined by speaker, social researcher, and best-selling author Shaunti Feldhahn to discuss her new book, The Kindness Challenge. 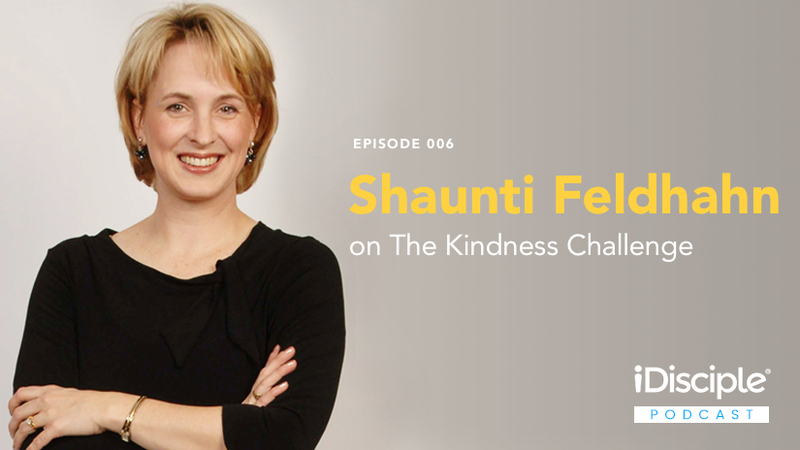 Shaunti shares with us refreshing and thought provoking wisdom about relationships and the role that kindness should play in our everyday lives. Shaunti Feldhahn received her graduate degree from Harvard University and spent time as an analyst on Wall Street before moving into a career as a social researcher, best-selling author, and popular speaker. Today, she applies her analytical skills to investigate truths about relationships, both at home and in the workplace. Her groundbreaking research-based books, such as For Women Only, have sold more than 2 million copies in 23 languages and are widely read in homes, counseling centers, and corporations worldwide. In her latest book, The Kindness Challenge, Shaunti reveals three simple steps proven to make any relationship thrive. Shaunti lives with her husband Jeff in Atlanta, Georgia. We pray that the wisdom shared in this episode will radically change your relationships for the better! Shaunti explains how doing something as small as letting another person control the television remote can impact a relationship. The difference between showing someone a surface level “niceness” and a more in-depth “kindness”. How The Kindness Challenge changes your relationships by first changing you. Why it’s important to not only show kindness to someone’s face, but also to speak about them kindly when they’re not around. Shaunti shares a powerful story about a woman whose marriage was radically changed when she began treating her husband with kindness, even when he didn’t deserve it. If you enjoyed this episode, head over to iTunes, Google Play, or Stitcher Radio and subscribe to the iDisciple Podcast. While you’re there, please feel free leave us a rating and a review. We love to hear feedback from all of our subscribers! If you would like even more life-changing content from Shaunti Feldhahn, download the iDisciple app for your preferred mobile device and subscribe to the Kindness Challenge Growth Plan. Since 2013, iDisciple has been leading people into a closer relationship with God through music, sermons, and devotionals, all in the palm of your hand! Check out iDisciple to learn more, and sign-up for iDisciple today.